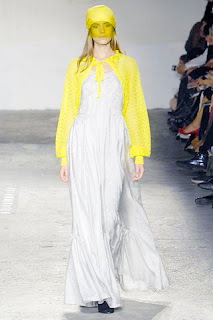 Veronique Branquinho's Spring 2008 RTW collection is full of hijab-friendly outfits, featuring plenty of loose, flowy maxi dresses and skirts. 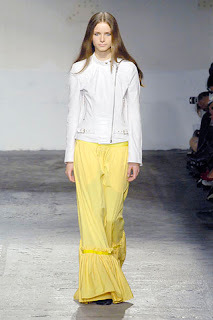 These four are combinations of my favourite summer colours - yellow and white. More from her collection to come soon! I've put together several items that you can mix and match to get the look. 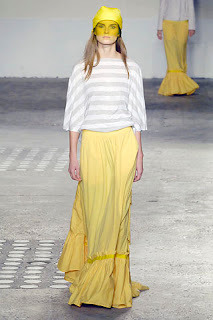 I think I'd go for the white maxi dress, white long sleeve top underneath, and the yellow tie cardigan, or maybe the striped top with the blazer and that gorgeous yellow skirt. Which combination would you choose? 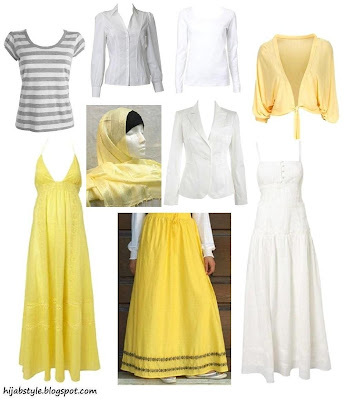 Stripe t-shirt £4, Debenhams; white pintuck shirt £16, Dorothy Perkins; white long sleeve top £15, Principles; tie cardigan £22, Oli; yellow hijab £5.50, Saif Clothing; white blazer £28, Debenhams; yellow maxi dress £45, Warehouse; yellow skirt £28.95, Shukr; white maxi dress £60, Warehouse. May Allah blessed you with your great ideas in helping muslimah to love the hijab. Yours are good one to be link. 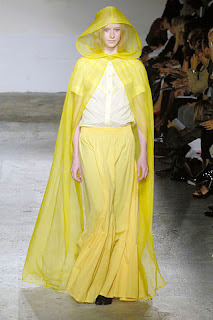 i would choose yellow maxi dress and white blazer and white hijab.Colours remind me of lemon-vanilla icecream,my favorite. Anon, I love those skirts! I posted them a while ago and it seems that Shukr have caught up with the trends!